98% of SMS messages are read within 3 minutes. Moobicast bulk SMS service is the easiest and fastest way to reach all your contacts and build better relationships that are effective and meaningful. Achieve your marketing goals at a low cost. Moobicast bulk SMS service is extremely affordable, compared to traditional advertising channels. Grow your business and generate more leads by reaching out to your target audience in Singapore and over 200 countries worldwide. Too busy, and have no time to broadcast SMS on your own? Simply tell us your requirements and we will do it for you, so that you can focus on what’s really important for your business. Want to roll out marketing campaigns at your own convenience? Simply upload your own contact list, and send SMS text messages straight from our web portal. Wish to send bulk SMS in Singapore and over 200 countries worldwide through your own company app, site or system? Our API is easy to integrate, making it the best choice for developers and your company to send bulk SMS. We Power Millions of Messages in Singapore and Over 200 Countries Worldwide. A. Simply fill in our fields and upload your customer contact list. B. Schedule your broadcast if needed. C. Click ‘Proceed’, and you are done! With no software required, you can immediately broadcast your messages easily from any web browser. Coupled with our user-friendly interface, sending up to 60,000 messages in an hour has never been easier. Moobicast allows you to be on track with your plans. You can schedule your SMS in advance and let our system handle the rest. Easily import your contacts from a .xls or .csv file to our server before sending! 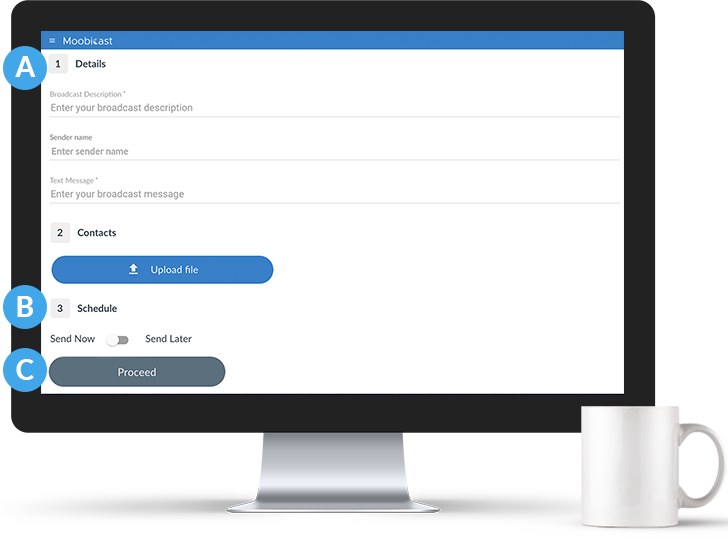 Our duplicates filtering feature also ensures that even if the database contains duplicate records, the recipient will only receive one message – saving you additional costs and reducing spamming. 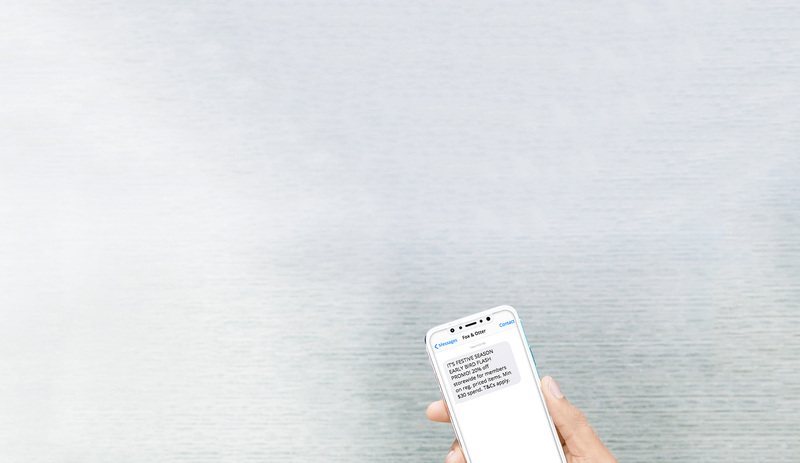 Easily add a personal touch to your bulk SMS messages by customising your messages for your customers. Easily replace keywords such as their names or birth date in the message. Moobicast’s auto subscription and unsubscribe features allow you to be in control of your subscriptions! Subscription lists are easily maintained through this feature. You’ll know who’s in and who’s out at the tip of your fingers. You can get reports which provide statistics to quantify your campaign, and data for you to identify the leads that generate the most revenue for your business. Engage and interact with your customers through the two-way SMS feature that allows them to reply to your messages easily. Keep your subscribers engaged and your brand at the top of their minds. 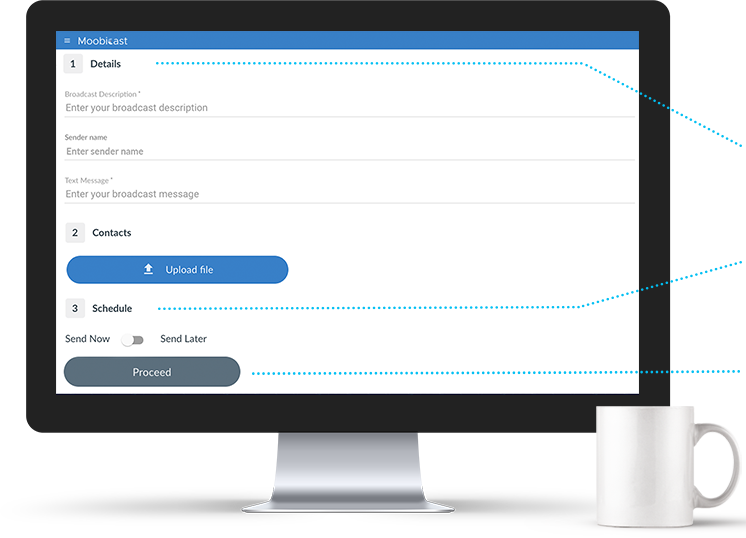 Moobicast complements your existing systems perfectly by introducing SMS broadcasting features to them. Reminders, notifications and birthday greetings are some of the added capabilities your existing system can be further empowered with. Looking for something else? Let's talk. What types of businesses is Moobicast ideal for? Moobicast can be seamlessly integrated into your existing systems such as point of sale (POS), customer relationship management (CRM), enterprise resource planning (ERP), and content management system (CMS). This will equip your business with additional features to provide your customers the optimum customer experience. Moobicast is a cost effective yet powerful bulk SMS platform that allows you to instantly send out high volume of messages simply by logging in via a web browser or the mobile app. Do I have to download a software to use Moobicast? You do not need to download a software to use Moobicast. Moobicast is web-based, which makes it easily accessible. Do you support multi languages? Yes, currently we support both English and Chinese texts. How do I ensure that my business adheres to the PDPA? To ensure that your SMS subscription lists do not contain numbers under the DNC registry, we offer DNC check services if you wish to ensure that your database is accurate. Start using SMS marketing to boost conversion rates, foster loyalty, and build lifelong customer relationships today!